← Winters in the Falklands – one pair of boots and crampons and a great day winter climbing. Tragic loss for us all the Loss of Andy Nisbet and Steve Perry in a climbing accident on Ben Hope . Yesterday the news came in that two incredible Mountain people had been killed on Ben More – Scotland’s most Northerly Munro! I knew right away that it could be a pal Andy Nisbet and his climbing partner Steve Perry. Unfortunately I hardly knew Steve but he was another powerful climber and one who was one of the strongest climbers in the SMC. (Scottish Mountaineering Club) He had done a unsupported traverse of all Scotland’s Munro’s in the past. I sadly had an awful feeling when I heard that there had been an accident on Ben More. I knew that Andy was up that way climbing as always on new winter routes. Andy was always climbing especially in winter with his many friends many who are some of the best winter climbers in the UK, that was who and what he lived for. Andy gave me a few photos for my Mountain Safety lectures I do not know who took them but if you can help please let me know. This one is iconic. It was in winter that Andy excelled he climbed all over Scotland most crags have a “Nisbet Route” and was “the expert in Scottish winter climbing” I was lucky to know Andy we met often on the hills. At one time he was the youngest to complete the Munro’s at that time at 17 years old. This is where we had a common interest in the hills, especially his marathon hill days with rock climbing added to produce some incredible days. Though he was such an incredibly talented Mountaineer he always had time to speak and give me and so many others the benefit of his knowledge. He was always interested in what we were up to and if we had found any new crags, on our wanders round Scotland with the RAF Teams. We met many times but one that stands out was on a wild night in the 80′ in the Hutchison Hut in the Cairngorms . I had fought my way round five Munros in early winter with a young troop, we so glad to find the hut empty. Andy arrived with the young Grahame Livingston after putting up a new route on Coire Sputan Dearg. I thought I was fit and in came Andy and Graham they were plastered in snow, with wild eyes it was very late and had been dark and a blizzard was blowing. It had been one of the worst days ever for me in the mountains yet how they climbed in these conditions I will never know. Yet we had a great night in that freezing bothy sharing our food and stories. We met often even on a Rescues and at Glenmore Lodge on routes across Scotland and many of my team especially the young ones of an Andy Nisbet story. He was such a good man and his encyclopedic knowledge of Scotland was unsurpassed. He was always been willing to share and help folk and pass on his knowledge. 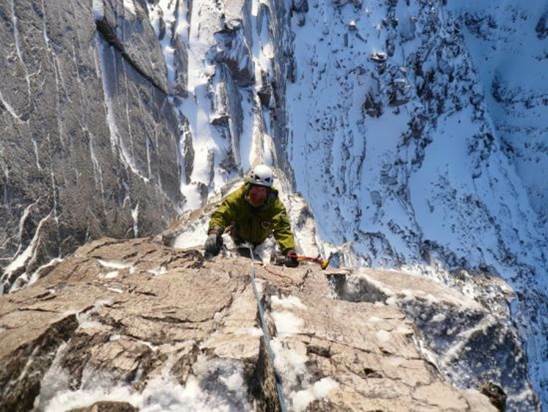 There will be amazing eulogies he climbed with most of Scotland’s great climbers. He started many on the road to the mountains in his guiding and so many will have a tale about Andy and Steve who was also a powerhouse in the mountains. He was so well known through his Guide books and articles and by those who knew him so well. Yesterday I lost a good pal who was a huge icon in Scottish Mountaineering. Many will miss that wild beard frozen up and his vagueness when chasing new lines on the mountains but what huge enthusiasm on the crag. He was a huge influence on the Scottish Mountaineering Club ( SMC) where he was on many of the Committees and served as President. I knew him for the many meetings we had with the Scottish Mountain Trust and the huge work he did for mountain lovers and the Guide Books that he loved and wrote. Sadly Andy and Steve are with us no more and we have lost two men who are irreplaceable in this wee country that we love. Steve and Andy had climbed a lot together they were a formidable partnership and the news is just starting to sink in. Its so hard to take in. We lose so many to the mountains it always so hard to understand why ? Sadly the pain we leave behind for the families and friends is heartbreaking. My thoughts are with Andy and Steve’s families and all their pals what an awful tragic day. The Mountain Rescue Teams of Assynt, Dundonnell and RAF Lossiemouth MRT’s carried out a huge call out along with the SAR Helicopter in such a remote area. My thanks are to them, many in the teams will know Andy and Steve and thanks for all their efforts. Andy Nisbet on Beinn Eighe. My thoughts are with Steve and Andy’s family and friends. How do we Justify a life – Dave Bathgate. It’s hard to take in, I keep hoping I’m having a bad dream. Andy for all his climbing achievements and fame once you met and knew him, you realised he was such a ordinary, humble, kind and genuine person who was always happy to share and chat to everyone whether in the mountains, at the crags or in the supermarket buying snowballs and sugarpuffs! He always that mischievous twinkle in his eye, as if he was a naughty schoolboy doing something he shouldn’t be, such as eating sweet and cake or mixed climbing as in this photo! His mate I didn’t know Steve that well and although outwardly different in character he was another genuine person who lived for his adventures in the mountains with Andy and mates and especially climbing new winter lines. The climbing world will be shocked. Andy Nisbet – photo Ron Walker. This entry was posted in Articles, Bothies, Mountain rescue, mountain safety, Scottish winter climbing., SMC/SMT, Views Mountaineering, Weather. Bookmark the permalink. 32 Responses to Tragic loss for us all the Loss of Andy Nisbet and Steve Perry in a climbing accident on Ben Hope . A touching tribute Heavy. Such a shock. Awful but a lot of his pals are abroad so this is one way they will know! I can never get used to these tragic events. Well captured Heavy, knew Andy in passing and will remember the knowing smile! Andy was such a constant in Scottish Mountaineering and was inspirational to many generations. Both are a great loss to their families, friends and the mountaineering community. Thanks for posting that Heavy, I think it probably sums up what a lot of us feel. Dave Bathgate’s poem is spot-on – although I admit I am now in pieces after reading it. Hello there- my name is Fran Docherty and I’m a journalist at BBC Radio 4. I’m very sorry to hear the sad news about your friend Andy and his climbing partner Steve. We’d like to speak to you to hear more about their mountaineering career. If you could give me a call today on 07853 395 794 or email on francesca.docherty01@bbc.co.uk I’d appreciate it. Best wishes. My son John and I had some memorable days with Andy being guided and instructed on The Ben. We have a montage on the wall at home of a great day on Tower Ridge. Neither of us can believe it has happened.He will be much missed. Thank you Ian great memories for you a sad time ! Ted Atkins and now, Andy Nisbet. They both climbed to incredibly high standards and died doing what they loved. No words can comfort family & friends but they do know their loved ones led a most fulfilling life. I meet Andy on a climbing day many years ago in the cairngoms, after having to back out of a out route we sat for some tea and a cold sandwich he came out of nowhere sat with us and chatted for a while he left a mark on me that day for how happy and genuine he was, He made our day but been nice after we were feeling down, he also commented on my beard both his and mine were frozen. So sorry to hear this news. He will be very missed. Dreadful news; thank you for your post. Anyone dedicated to the mountains in anyway will have met or heard of andy..such a loss to this environment. .. I put this together, as kindred spirit of big hill walks, to tell something of the connection between Steve Perry and Ben Hope. 4 years on, and in 2007, Steve went on to complete the only solo unsupported Winter round of the Munros, his journey ending on Ben Hope. This mountain, being the furthest North of the Munros, merits its’ iconic status in the minds of those completing a continuous Munro round, and uniquely so in the case of Steve Perry. Rest in peace, Steve, and Andy. Your blog is a wonderful resource, and your deep love of the mountains and their people makes it a fitting place to talk about Steve. Dan Bailey, he of UKC fame, might have, or maybe Lorraine McCall? Thank you another bit of Andy that few know about thanks. Thank you both great men huge loss.